Vous êtes ici: Accueil»La Scena en ligne»Communiqués»Announcing … The Montreal Chamber Music Festival 2019 Programme! Highlights of this year’s programme are two complete surveys: the Beethoven Violin Sonatas performed over three evenings by 2019 Grammy winner James Ehnes and pianist Andrew Armstrong; and the Beethoven Symphonies Nos. 1-9 as transcribed for piano by Franz Liszt, over five concerts, with six outstanding pianists from across Canada and the world. The Festival opens with a very special treat for audiences, the Montreal premiere of a new show by Gregory Charles, an exuberant survey of the past 250 years in music, across all genres. This year’s Festival also proudly showcases Joseph Kaiser, the extraordinary Metropolitan Opera tenor from Montreal, the best young talent from across the country in BMO Hottest Classical Artists Under 30!, a series of free noon-hour concerts, and a special hommage to Albert Millaire. The Festival opens on Friday, June 7 at 8 p.m. at Pollack Hall with the phenomenal Quebec pianist and entertainer Gregory Charles in the Montreal premiere of l’Air du Temps. The new show is a bilingual look back on the past 250 years of Western music, from Baroque to hip-hop and from the French Revolution to the digital revolution. Don’t miss this rare opportunity for a one-of-a-kind evening with the most passionate troubadour of our time! The Festival welcomes home tenor Joseph Kaiser, internationally-acclaimed for his beauty of tone and musical intelligence, who appears in two superb evenings of chamber music at Salle Bourgie. 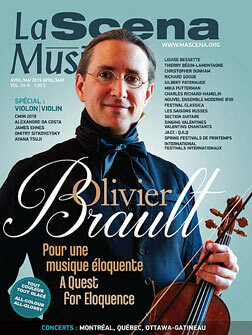 Masters in Performance on Tuesday, June 11 at 8 p.m. features Kaiser with Martin Beaver, former first violinist of the Tokyo Quartet; cellist Denis Brott; Israeli pianist Alon Goldstein, a returning Festival favourite; and the brilliant Danel Quartet from France, making their Festival premiere. Repertoire includes Beethoven’s Folk Songs for tenor and piano trio, the quintet for piano by Dvořák, and the rarely-heard Weinberg String Quartet No. 5. This evening also includes an extraordinary discovery: the Canadian premiere of a new composition revealed in 2018 among a collection of manuscripts untouched since the war found at the Auschwitz-Birkenau Museum. University of Michigan music professor Patricia Hall unearthed the heartbreakingly titled « The Most Beautiful Time of Life » (Die Schönste Zeit des Lebens) by Franz Grothe (1908-1982). Hall believes the piece, a popular fox trot of the day, was performed circa 1942 by prisoners in front of the commandant’s villa for Sunday concerts for the Auschwitz garrison. The Festival’s tribute to vocal art continues on Wednesday, June 12 at 8 p.m., with Viva Voce featuring music by Brahms, Respighi, Richard Strauss, and Chausson. Joseph Kaiser is joined by mezzosoprano Jeanne Ireland, violinist Martin Beaver, pianist Alexander Ullman and the Danel Quartet. Free Noon-hour Concerts: BMO Hottest Classical Artists Under 30! In 2019 the Festival continues its tradition of featuring Canada’s best emerging talent. Entitled BMO Hottest Classical Artists Under 30!, the Festival presents a new series of five admission-free noonhour concerts, June 11 through 15 at Salle Bourgie. The brilliant, emerging artists include pianist Alexander Ullman; cellists Cameron Crozman and Bruno Tobon; and violinists Christina Bouey, Byungchan Lee and Emmanuel Vukovich. Music includes works by Handel, Ravel, Stravinsky, Bach, Beethoven, and more. In addition, courtesy of Metro Inc., a complimentary snack will be offered! The concert on June 15 at 12 p.m. will be recorded by ICI Musique. Quebec’s legendary actor and playwright Albert Millaire is the subject of an homage inspiring the closing concert on Sunday afternoon, June 16 at 3:30 p.m. Entitled « Tchaïkovski, je vous aime », the concert pays tribute to the life of the late actor Albert Millaire (1935-2018) through the performance of Millaire’s unique script commissioned by the Festival in 2011. This re-enactment of Tchaikovsky’s intimate letters with his patron Nadezhda von Meck is a fantastic synthesis of words and music performed in French and English by extraordinary Quebec actors Jean Marchand, Monique Miller, Frédéric Millaire Zouvi, and Stéphanie Germain. In what has become a Festival tradition, this concert highlights the extraordinary winners of the 2018 Canada Council for the Arts Musical Instrument Bank Competition, this year led by the outstanding Canadian violinist Martin Beaver.